Registration: Registration is full. If you would like information on the waitlist please contact us at nccrdcstraining@redcross.org. cost of the Institute covers lodging, training, and most meals. You will have a choice between two tickets: NCCR Disaster Training Institute Commuter or NCCR Disaster Training Institute Overnighter. Overnight tickets are $45 and are good for one to three days of training, depending on your course selections. A $25 Commuter ticket includes lunch and also can include dinner if you reserve it. Ticket prices are guaranteed until May 30th. We have lodging available Friday, June 19 & Saturday, June 20 (our Thursday lodging is full). Each room is a private room with a queen size bed and a private bath. Lodging is available on a first-come, first-served basis. If you have special lodging needs you will have the opportunity to list that in the second phase of the registration process. If you have lodging questions, please contact anna.wieger@redcross.org. Below you will find the schedule of each day’s classes. If you are interested in finding out more about a course and its requirements, click on the Course Catalog on the right. 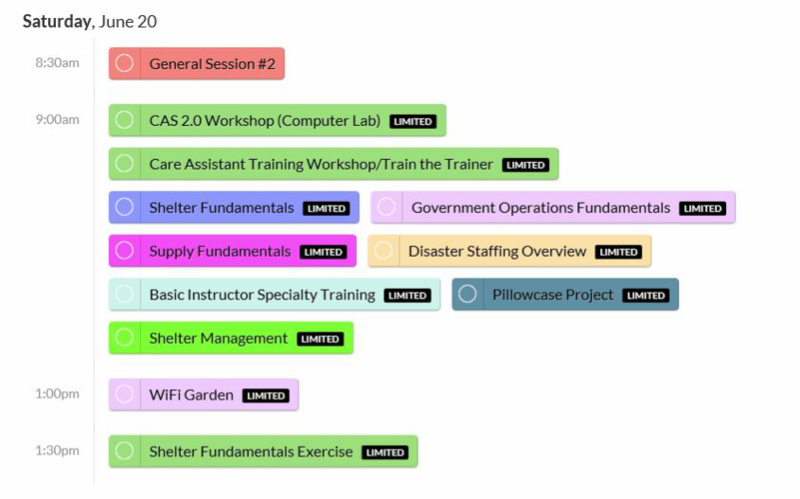 If you need help picking out courses, you are welcome to talk to your Disaster Program Manager or contact our NCCR Institute "career counselor" who can help you decide which track you should take based on your experience and interests. 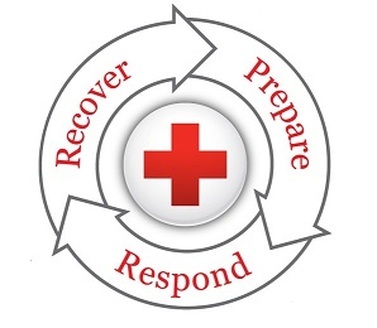 Please email Meg McDonald for assistance with your schedule at nccrdcstraining@redcross.org and use the subject line "Institute Career Counseling." 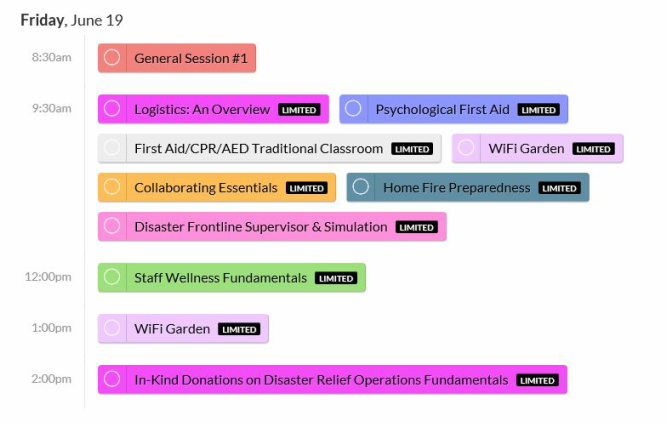 Below you will find the courses offered each day at the NCCR Disaster Training Institute. If you are interested in finding out more about a course, its requirements, and/or its prerequisites , click on the Course Catalog on the right and explore our upcoming courses. We also encourage you to explore the suggested tracks. If you've had a course in the track, you can substitute another course into that spot.